I don’t think much about my personal space—the imaginary hulu hoop sized air around me—until someone invades it. I’m sure it’s happened to you, too. You meet someone for the first time and within minutes she’s talking with her face less than a foot from yours. You take a step back but she doesn’t get the hint and moves towards you again. Similarly, I had boundaries in my life that I wasn’t aware of until they had been crossed by Buzz, our recent foster son. The two major ones were related to sleep/wake times. These are personal and different for every person, but I hope to encourage you if you have boundaries you’ve allowed other to cross – reclaim your personal space! First it was at bedtime. Buzz would get very emotional and needy (AKA stalling…) at bedtime. In order to help ease his transition, I would put Ali to bed first and rush because he was a distraction to her. She would get upset but I knew she’d recover and go to sleep on her own. I’d end up reading him a couple more books in his room, saying night time prayers, letting him watch videos his mom sent saying goodnight, put on music and then, by his request “stay,” I’d set at the foot of his bed until he fell asleep. After a while of this, Jason challenged why I was doing this. It was dragging out his bedtime longer and later and eating up my very limited time at the end of the day for me (doing dishes, tidying up, writing blog posts, showering, laundry, spending time with Jason, paying bills, etc.). I started reducing the time I would sit in his room rather than waiting for him to fall asleep. 10 minutes. 5 minutes. I stuck at 5 minutes for a while and Jason challenged me again – “LIke a bandaid, ” he said, quoting Seinfeld, “Right off!” The first night that I kissed him goodnight and left his room without answering his plea to “stay!” he cried for a minute, then Jason went in and told him to stop and go to sleep. He cried for about 30 seconds more and then went to sleep. That was the end of that! I got my nights back. I also realized that it was unfair to Ali to be rushed to bed and to lose that one-on-one time at the end of the day. At that point I started alternating. One night I would read books to both kids in Buzz’s room, tuck him in and then go with Ali into her room to tuck her in. The next night I would read books to both kids in Ali’s room, tuck her in and then go with Buzz into his room to tuck him in. They both really seemed to like and understand this system and would always remember which night it was for books in which room. The second area of boundary crossing was in the mornings. 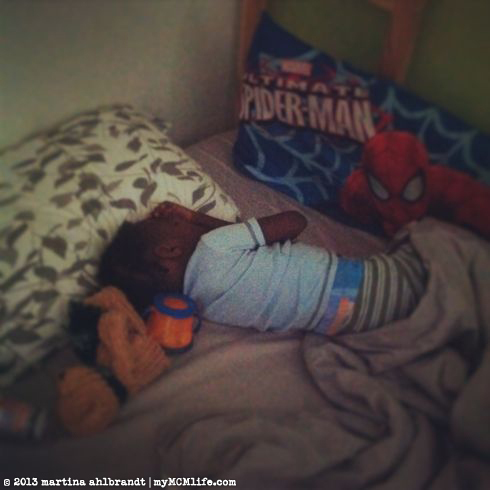 Parenting Buzz was our first experience with a kid who sleeps in a bed rather than a crib. 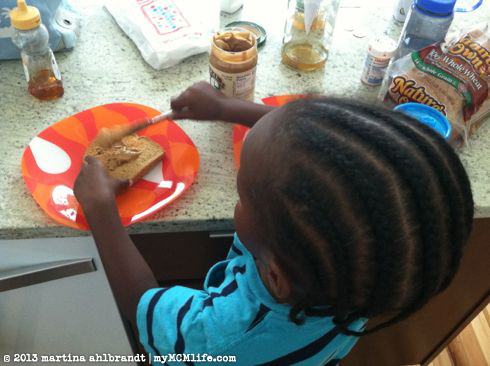 That was a level of freedom around the house that required us to set boundaries for his safety. We were totally learning as we went. The first time he let himself out of the house during nap time was a huge eye opener. After some very serious talks and consequences, we didn’t have any repeat incidents, though we had to remind him several times (during waking hours) not to let himself out of the house without permission. He’s a smart kid but also very resourceful. The problem with mornings was that his wake times were all over the place. 5:30 one day. 7:00 another day. I’d have to wake him up at 8:30 another day. My pre-Buzz morning routine was to wake (gradually…) at 6:30, spend time with God and a cup of tea from 7-7:30, take care of the dog and get ready for work from 7:30-8:30. Ali would get up around 8:30 too. Buzz’s random wake up times hijacked my mornings. I lost my easing into the day, my alone time, my quiet time with God, my chance to take Lucy for a walk, my time to shower and get ready uninterrupted. (Side note: I’m very intentional about being the first one up so I can prepare for my day and prepare to receive my family in the morning.) It took me two months to realize that I didn’t have to give up my mornings. I was my choice. I am the parent. I could set a boundary line around this sacred time and enforce it. We got a special clock for Buzz’s room that lights up when it’s ok to come out of the bedroom. It took him a while to get the hang of it but it restored my mornings for the most part. I’d often have to take him back to his room, where he’d pout and fuss but eventually he would look at books or pick out his clothes for the day and wait until the clock lit up (at 8 am, if you’re curious). There were lots of other areas where boundaries were crossed and then more clearly established (just as with parenting any child) but these two areas were key to my sanity and my relationship with the rest of my family during the 3 months that Buzz was with us. They also gave me some wisdom and experience before we gave Ali the same freedom. 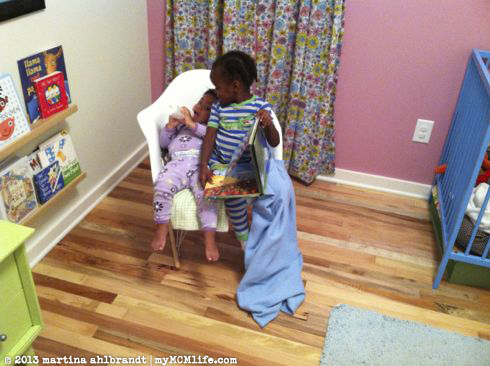 This is part 1 of a 2 part prelude to my post about transitioning Ali to her big girl bed that’s coming later this week. This entry was posted on Tuesday, August 13th, 2013 at 6:00 am and is filed under Family, Family: Buzz, Family: Foster Parenting, Family: Me, Family: Precious/Ali. You can follow any responses to this entry through the RSS 2.0 feed. You can skip to the end and leave a response. Pinging is currently not allowed. Yes, so good to recognize these sacred times. I was totally looking into one of those clocks, but we just opted for mom letting everyone know when it was ok to come out. If that works it’s a nice cheap solution!